You know that montange in Bridesmaids where Kristen Wiig’s character makes herself a single, perfect cupcake for herself? I don’t know that Weebro has seen that film, but he made me a single, near-perfect veggie burger (including the bun) and a single, unknown-quality beef one for himself for supper last night. Which is really sweet of him, but pretty frickin’ peculiar/hilarious. I never cook without considering how useful leftovers would be. Because a burger for lunch today would have been great. Today in stuff I learned: Ted Cruz is the same age as Matt Damon. 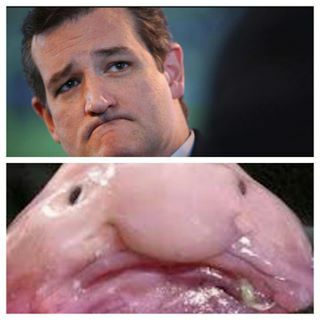 I understand that one is an actor and paid to look fit and great, and another might be a blobfish, but that he was born in the 1970s really shocked me. I guess that I always assume that conservative politicians are relatively ancient. Today in Gilmore theories: In one of the world’s great team-ups, Lane Kim and Richard Gilmore convinced Luke to franchise the diner. Lane now runs the highly successful outlet in Park Slope.